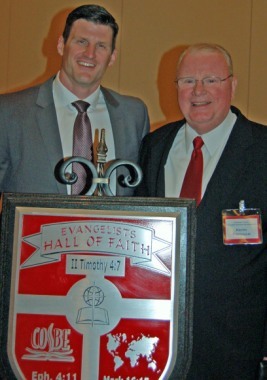 On June 7th, 2014 at the annual meeting of the Conference of Southern Baptist Evangelists, Dr. Keith Fordham was inducted into the Evangelists’ Hall of Faith. This honor recognizes Keith’s lifetime of ministry for the Lord and His Church as a God-called, gifted evangelist of the Gospel of Jesus Christ. Read the article below or on ChristianIndex.org. Those who respond to God’s divine call to be a vocational evangelist in this present culture are to be commended for their obedience and faith. It is to our shame that fewer and fewer churches are having revivals and evangelistic crusades. This reality leaves a void in the church and makes it difficult for evangelists to fulfill their calling. It is remarkable that Keith Fordham has just completed 50 years of preaching the Gospel, 44 of those years as an evangelist. To commemorate Fordham’s half century of ministry his church, Harp’s Crossing Baptist Church in Fayetteville, had a special day on Sunday, Jan. 21 to honor his long and distinctive ministry. Dennis Watson, pastor of Harp’s Crossing, commented, “What a blessing to have a preaching staff evangelist in our church, who has been preaching the Gospel for 50 years! This is an incredible blessing of God! Keith and Shirley Fordham have been part of Harp’s Crossing for 30 years. Keith is a faithful servant and wonderful encourager to our staff, as well as the church body. Fordham was saved in October of 1960, but God began speaking to his heart as a teenager about surrendering his life to full-time Christian service. Fordham explained, “My pastor at Calvary Baptist Church in Forest Park invited me to preach a sermon when I was 17 years old and the sermon lasted six minutes. One man told me after the service, ‘You might make it as a preacher one day.’ But I was not pleased with my sermon and resolved that day that I would never preach again. The Fayetteville evangelist has always preached the Gospel with the clarion call of a trumpet. He communicates God’s message with courage and conviction. An example of his bold stand as an ambassador of the Lord was evidenced early on. Because in the 1960s the Supreme Court was making decisions to ban prayer and Bible reading from the public schools, Fordham went into the high school principal’s office one morning. However, the principal was not there. So, the brave and intrepid Fordham flipped the switches to all the classrooms’ loudspeaker systems. He announced he was going to lead the faculty and students in prayer, doing exactly that. In June 1972 Keith Fordham and Shirley Alice Waldrop married. He is a graduate of Samford University, New Orleans Baptist Theological Seminary, and has a Doctor of Ministry from Immanuel Baptist Theological Seminary. Shirley is a graduate of Tift College and the Georgia Baptist School of Nursing. Shirley plays a vital role in her husband’s ministry and typically travels with him to his speaking engagements. Keith is a member of the North American Association of Ventriloquists and his unique ministry includes his “Pal” Homer; Shirley conveys Bible lessons using her “Pal” Joy. On the Sunday in which the Fordhams were honored for their 50th year in ministry, Keith preached on Sunday morning at Harp’s Crossing. His message was titled “God’s Will For Your Life,” based on Ephesians 5:15-21. Fordham explained, “It is God’s will that every Christian be a witness, tithe, be baptized, and be an active member of a local church. You do not need to ask God if these things are His will. You are to do them. The response was overwhelming as approximately 50 young adults responded and came to the altar in response to the invitation. After the morning services two Sunday School classes hosted a lunch honoring the Fordhams to enhance the celebration of their 50 years in ministry. The luncheon was accented with appropriate testimonies, including one from music evangelist David Akin. Fordham also preached on Sunday evening, after special music by Akin, delineating the difference between the rapture and the second coming of Christ. A reception followed the evening service and a love offering was received and given to the faithful evangelist. It was a glorious day for the Lord and an appropriate way to honor the strategic ministry of a couple who have labored in God’s vineyard for five decades.